FIFA 18 FUT Champions has been a huge success. It rewards the best players with amazing prizes. Weekly rewards are great but monthly rewards are even better. 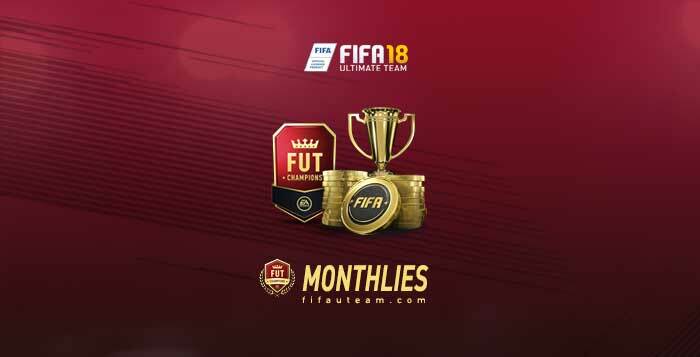 In this page, you will find out the release date of your FIFA 18 FUT Champions monthly rewards and what prizes you can win in each month, including the FUT Champions cards available. Weekend League rewards are delivered every week, only to who has completed at least five matches in the previous weekend. The cards from the packs are tradeable, which means that you can sell them in the transfer market if you wish. You don’t need to open the packs in the week they are assigned to you. They can be stored to be opened later. They don’t expire. Monthly rewards are delivered every month, only to who has ranked at least once. The cards from the packs are untradeable, which means that you can not sell them in the transfer market if you wish. Every month, people ask us when prizes will be delivered. There are no official monthly rewards dates but in this page you will find out the most likely ones, based in our experience of previous months. does anyone have any idea which cards area avalible from the July monthlys? Hi guys! Does anyone know if we’re getting TOTS for Monthlies on the 6th of June? Thanks ! We still don’t know. Probably yes, but it was not confirmed. They are delivered every Thursday at 6pm UK time. ive received my fut champs rewards for this week, but for some reason i havent received my monthly rewards at the same time, my son has an account and he received both rewards weekly and monthly together/ do you know why? If you received the weekly rewards it was supposed to also receive the monthly rewards. You will have to contact the EA Support. Quais partidas precisa jogar para ganhar essas reconpensas? Tem que ser multiplayer ou pode ser no single player do Squad? Tenho jogado todo dia e conseguindo as recompensas semanais, mas nunca ganhei nada mensal…. Se jogar single player, então o que está a jogar é Squad Battles. Esse modo não tem prémios mensais. I dont really get it sry :D, do we get the monthly rewards on 2, November or on 9, November. Or is it not sure and it could be either day ? Last year they took 2 weeks to delivery the rewards but this time they were much faster. A carta TOTW do Messi saiu na TOTW 2. Se a EA seguir o que fez o ano passado, as cartas que saíram nas TOTW de setembro não entram para as premiações de outubro. If you get bronze rank in monthly, last year you got bronze red informs. What do you reckon you get this year with no bronze informs? Great question. I remember to read about it from someone of EA but can’t find it now. If I’m not wrong, you will only have chance to pack players that were bronze. Anyone know where I can see this information?